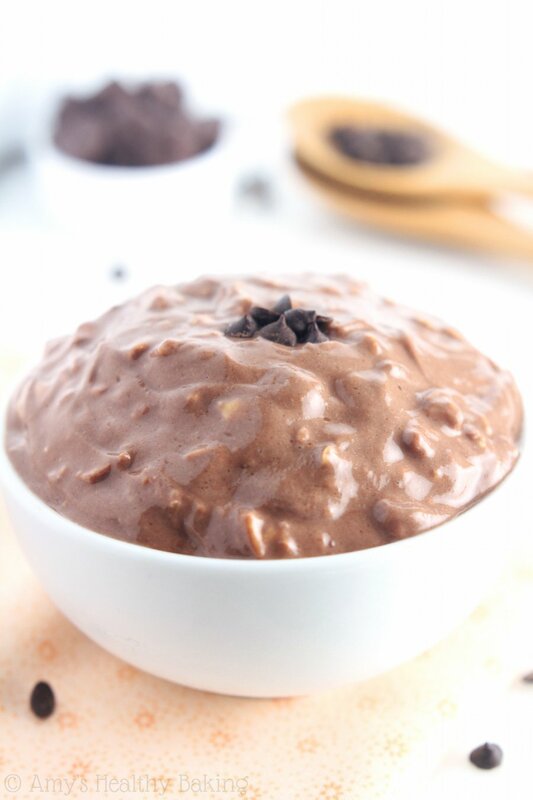 A 5-ingredient recipe for healthy, protein-packed chocolate overnight oats. 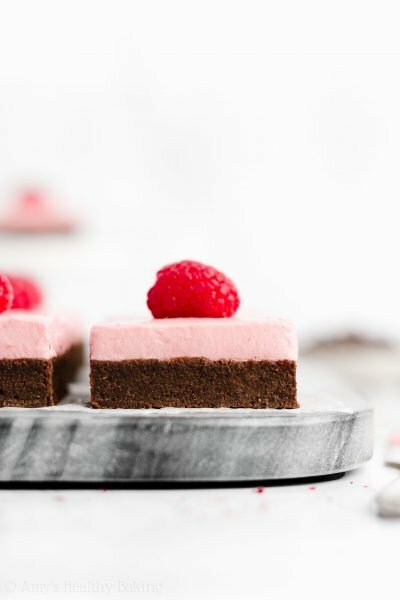 They practically taste like a cross between hot chocolate & fudgy brownies! My first winter in grad school, the professors played a mean joke on us. Our classes started at 8 am three days a week and 7:30 am the other two. With the sun barely above the horizon, the temperatures weren’t much higher, and a thick fog rolled in every night with water droplets so big it almost felt like you took a second shower just by walking outside. I started to dread my morning alarm clock, so to sleep in as long as possible and prolong the inevitable walk across campus, I began making my breakfast and lunch the night before. With enough papers to grade in the evenings, my meal prep as very basic and usually consisted of fruit and dry cereal, plus veggies and a sandwich, but every once in a while if I had an extra 5 minutes to spare, I mixed up overnight oats. 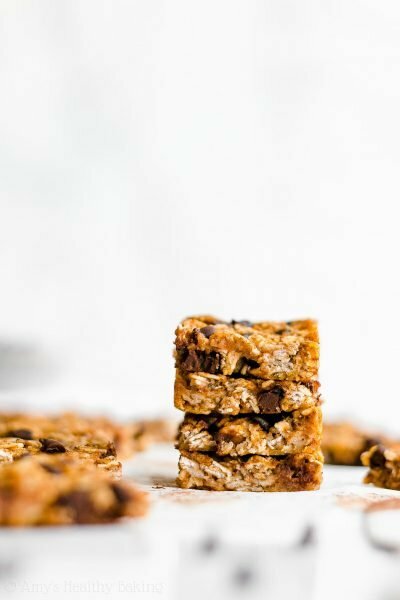 I usually kept things simple—milk, yogurt, cinnamon—but occasionally I threw in raisins to make them taste like my favorite oatmeal cookies or fresh fruit for a juicy twist. Although I may not have thought of them all with my brain so full of chemistry, the possibilities really were endless! 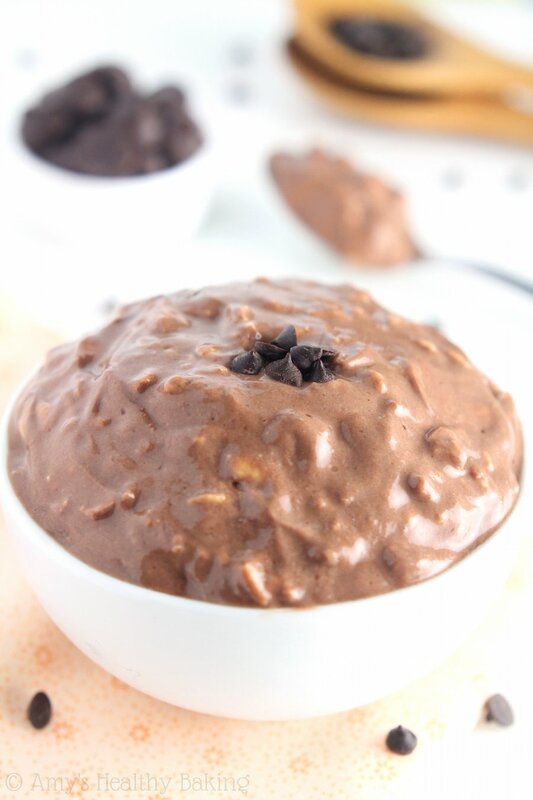 These Chocolate Protein Overnight Oats were one of my favorites. I just needed 5 standard pantry staples, nothing strange at all. And they’re so full of chocolate that they practically taste like a cross between hot chocolate and brownies! 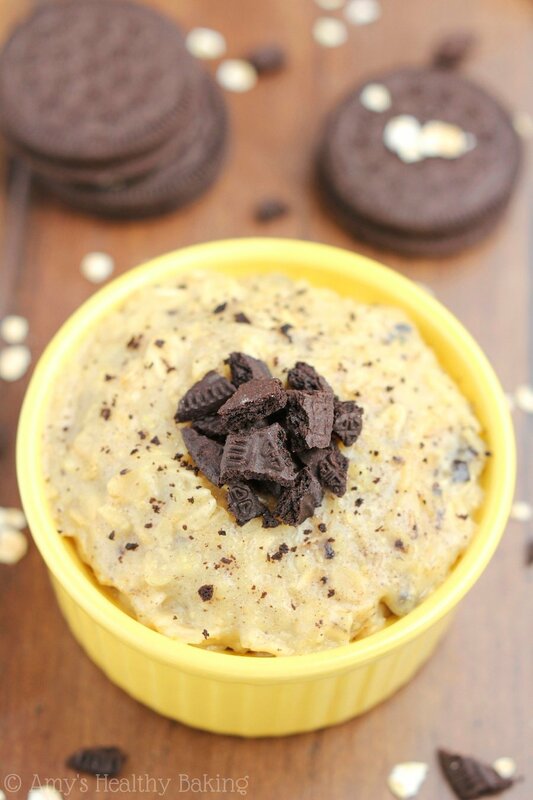 For those of you who haven’t heard of overnight oats, they’re really easy to make. Simply add all of the ingredients to a jar or container with a lid, stir, cover, and let them chill overnight in the fridge. 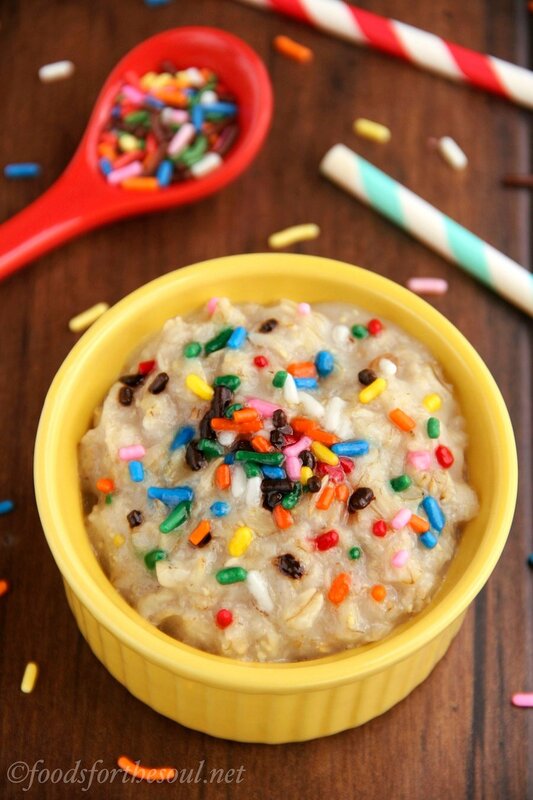 It’s a way to eat your oatmeal cold, but it still has the same soft texture as when you cook it on the stove. They’re great for the summer or breakfasts on the go! I generally lean towards old-fashioned oats for these because I love their thick, hearty texture. 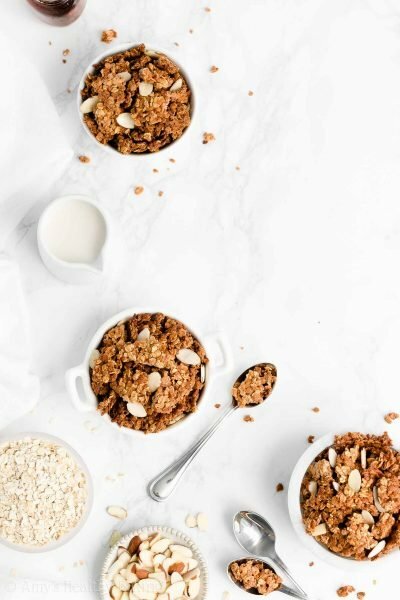 Quick-cooking (aka minute or instant) oats will also work too, if that’s all you have in your pantry, but since we’re letting them sit for at least 8 hours (get as much beauty sleep as you can! ), it isn’t necessary. 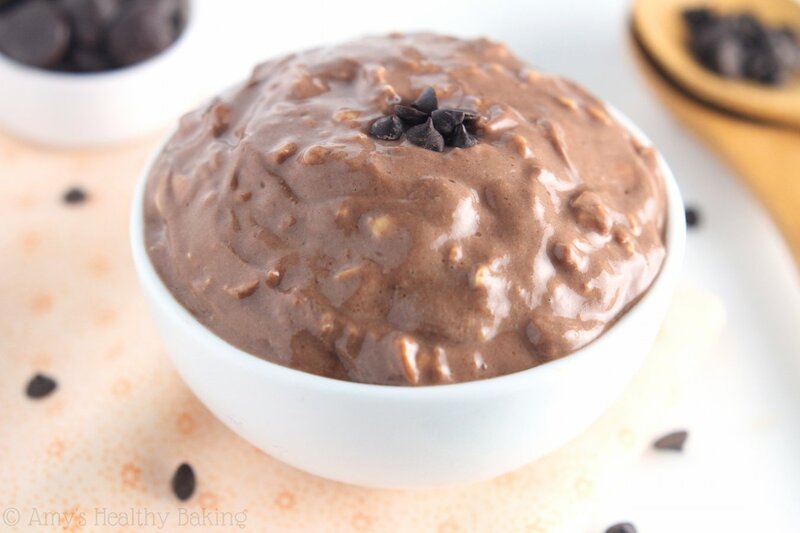 To boost the protein in these chocolaty oats, I turned to Greek yogurt. I’m not a fan of protein powder in my smoothies or overnight oats just yet. I haven’t quite gotten past its slightly grainy texture. Maybe someday! But for now, plain nonfat Greek yogurt adds the protein I want, as well as an irresistible creamy richness. Since the yogurt alone won’t quite soften the oats all by itself, you’ll also add a tiny bit of milk. The mixture may look a little watery at first, but the oats act like little sponges while you sleep and soak up most of the moisture. All of the chocolate flavor comes from cocoa powder. 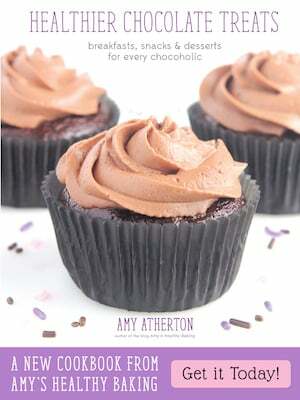 You’ll need 2 tablespoons, and if you’re a chocoholic like me, make sure they’re heaping! To balance it out, add a little sweetener, however much you need to make your taste buds happy. Then in the morning, grab a spoon and enjoy! 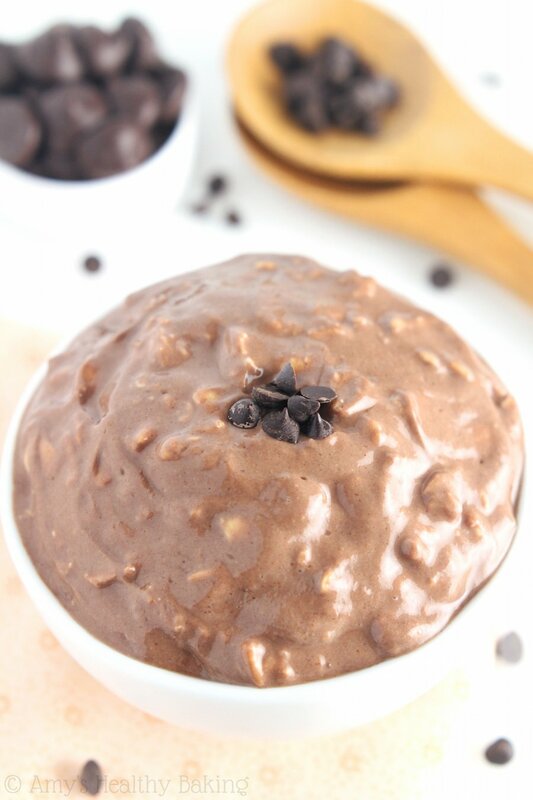 These overnight oats practically taste like a cross between hot chocolate and fudgy brownies! You can easily double or triple the recipe to serve more people—or just keep them all to yourself and have breakfast already made for a few days! Add all of the ingredients in the order that they’re listed to a mason jar or container with a tight-fitting lid. Stir to combine. Screw on the lid, and refrigerate the oats overnight or at least 8 hours. Notes: The oats will keep for up to 4 days if stored in an airtight container in the refrigerator. Any milk and yogurt will work. However, most yogurts don’t contain the same amount of protein and thick creaminess as Greek yogurt. 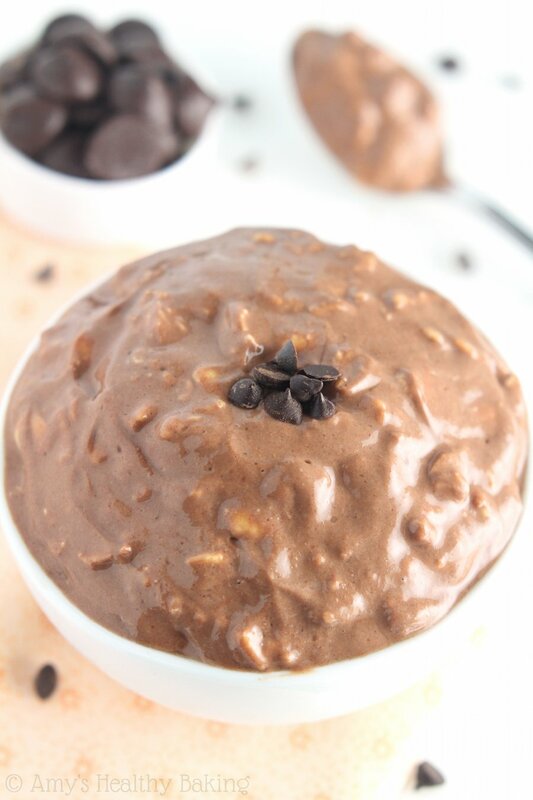 I just saw this and I will make it for tomorrow:) but how many calories are there in the whole bowl? The full nutrition information is actually included directly underneath the recipe! It can be easy to miss. 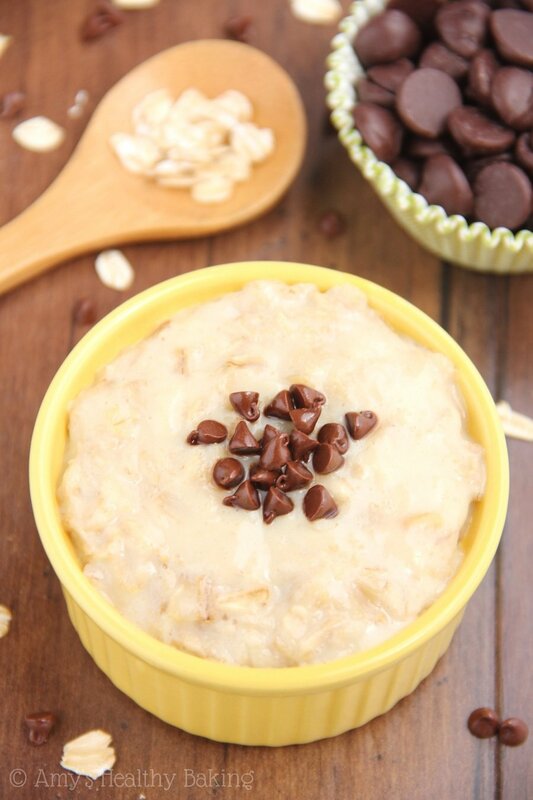 🙂 I can’t wait to hear what you thought of these overnight oats, Emilie! Tasty! I made this and used 4 tsp of maple syrup for the sweetener. I would NOT do heaping tablespoons of cocoa powder next time, just straight 2 tbsp. It was delicious though and came out tasting like a chocolate mousse! I actually ate half of it for dessert tonight and will do the same with the other half tomorrow 🙂 Thanks! How many Truvia packets make 2-3 tsp? Also, can you use dark chocolate unsweetened cocoa powder? I really appreciate your interest in my recipe, Marie! One Truvia packet should be the equivalent of 2 teaspoons of granulated Truvia, so I’d use 1-2 packets. 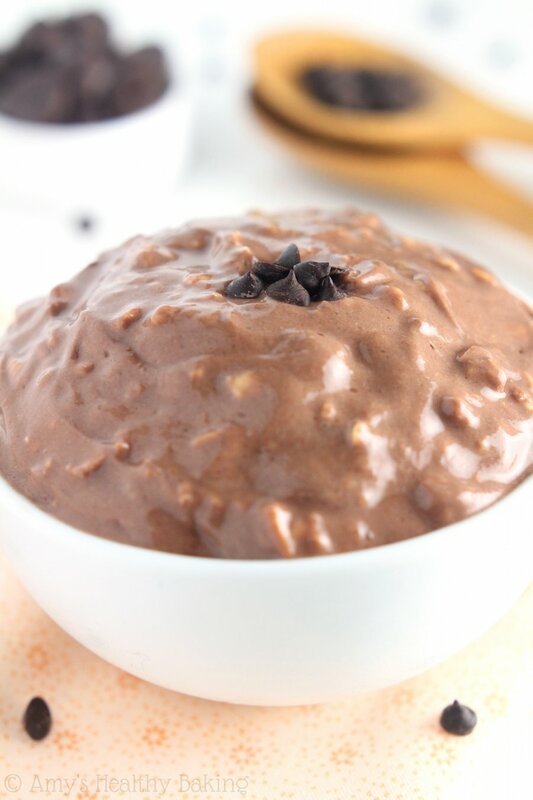 You can substituted special dark cocoa powder if you prefer (I’ve found its chocolate flavor isn’t quite as strong as regular unsweetened cocoa powder, so keep that in mind!). 🙂 I can’t wait to hear what you think of these overnight oats! Thanks, Amy! Finally tried these 🙂 They were good, but I think the dark chocolate powder was a little too bitter tasting. Next time I will buy the regular chocolate. I’m glad you enjoyed these overnight oats, Marie! 🙂 Did you happen to scoop the cocoa powder directly from the container with your measuring spoon, by any chance? 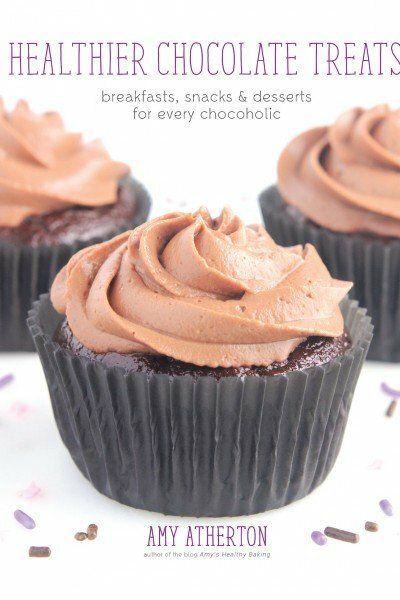 Can you recommend the best make of cocoa powder to use for this please, I am also a massive chocoholic so I like it really chocolatey!! I really appreciate your interest in my recipe, Jessica! 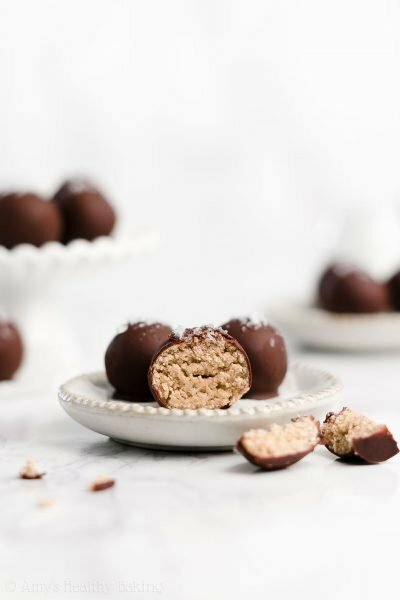 I always use Hershey’s cocoa powder in my recipes — just the regular kind, not special dark. 🙂 I can’t wait to hear what you think of these overnight oats! Yum!!! Tasted just like a dark chocolate brownie! But I have to say I heated them up cause I can’t eat cold oatmeal but a great recipe for breakfast! Thanks Amy!